San Jose State Student Population: Who Goes Here? 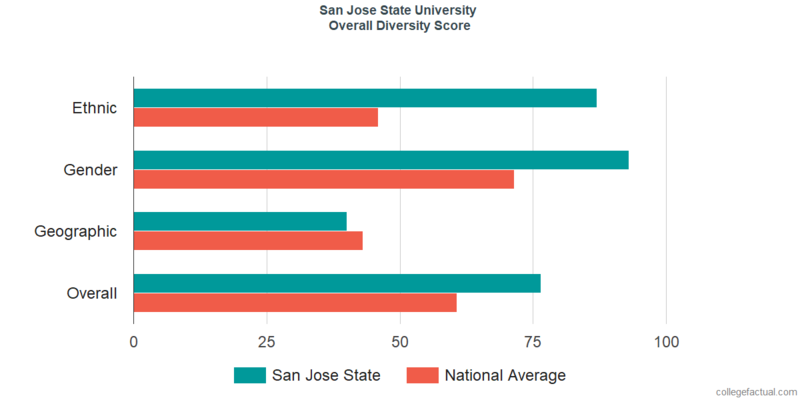 Get Some Knowledge on Diversity at San Jose State, Including how This School Compares to Others in the U.S..
Ranked #414 nationwide, San Jose State University is above average in overall diversity. Many college students value the opportunity to meet and learn from different ethnic and racial groups, which is possible at a diverse institution such as this one. Sitting at #157, San Jose State University has received an excellent ranking for ethnic diversity nationally. 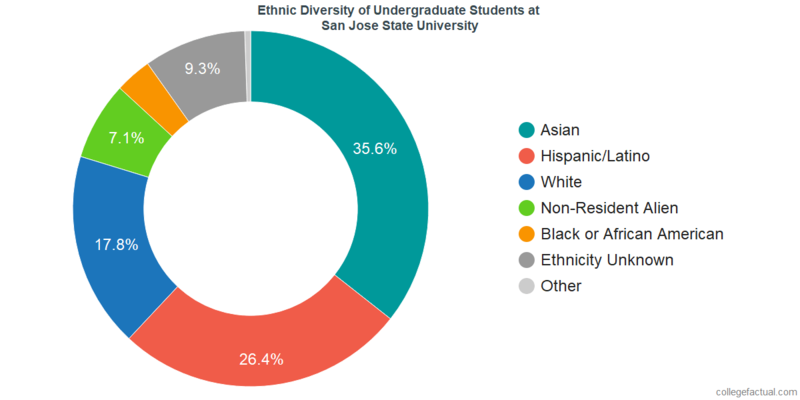 The chart below will display the diversity of undergraduate students at San Jose State when it is available. San Jose State boasts excellent ethnic diversity. At San Jose State University, the disparity between men and women on campus is far lower than the national average. The undergraduate student body at San Jose State is equally balanced. This university is ranked at #316 in male to female diversity nationwide. The undergraduate population is comprised of 13,859 males and 12,573 females. Where available, the chart below will include the male to female percentage among San Jose State's undergraduate students. The male to female ratio at San Jose State is excellent. Where available, the chart below will include the male to female percentage among San Jose State's faculty. The ratio of male to female faculty at San Jose State is excellent. Would you prefer a local college that primarily pulls students from within California? This could be a good choice for you. We've derived the geographic diversity of each school by looking at where undergraduates lived before they attended college. 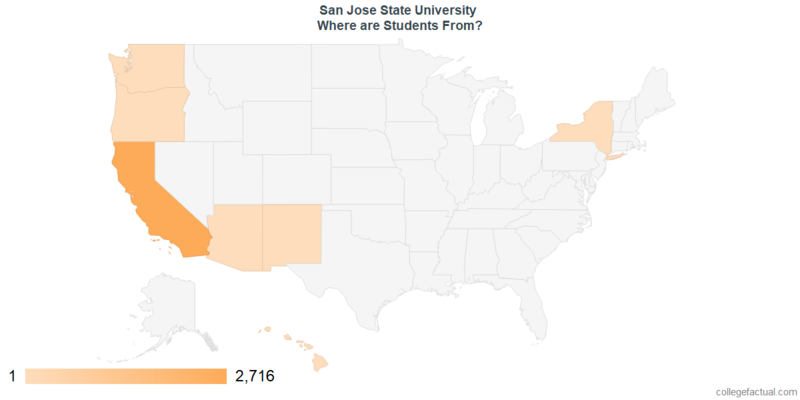 Over 90% of the students attending San Jose State University come from within California. This means San Jose State is below average in geographic diversity with a ranking of #1,512. The undergraduate student body is split among 23 states (may include Washington D.C.), as shown in the chart below. There is a large community of about 3,951 international students at San Jose State University representing at least 45 countries. To learn more, see the San Jose State International Student Page. The traditional student is between the ages of 18-21. At San Jose State University, 40.1% of students are in the age 18 to 21 bracket, compared to the national average of 60%. We rank San Jose State #1,741 in the nation for student age diversity. 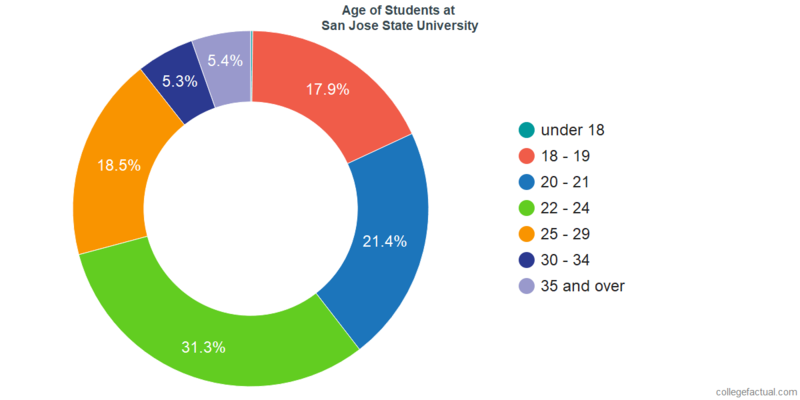 Analyze the age range of San Jose State students with the following chart. Often when we speak of diversity, which is defined as "variety", what we mean is multiculturalism, or the acceptance of people of different ethnicities, cultures, races, religions and financial backgrounds. Diversity can be a huge benefit to students, as it not only exposes them to new ways of thinking, it prepares them for the varied workforce of tomorrow, as well as inspires creativeness and innovation. Is San Jose State supporting students from all backgrounds? Schools with higher than average ethnic and location diversity still may not be diverse when it comes to other factors, such as economic backgrounds. Get a better idea of how San Jose State supports low-income students by visiting the Financial Aid Page. Is Diversity Important to San Jose State? Diversity can be encouraged by the university in several ways. First, institutions should be making an effort to hire a varied faculty to engage students. But the school should also be doing the best they can to foster substantial interactions between people from different backgrounds. This prevents students and faculty from self-segregating and helps bring about positive connections.